If you don’t know what a Cronut is, read the following – if you know what it is just skip ahead to the next paragraph. 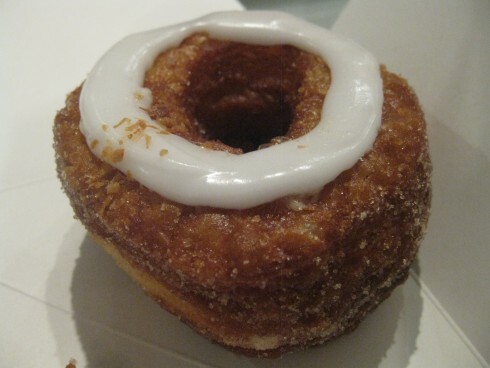 A Cronut is a confectionery delight often referred to as a Frankenpasty. It’s as if a doughnut and a croissant made sweet love and had a baby. So, you get the doughnut-looking firm exterior and the delicate croissant-looking interior with just a little cream as a bonus. Now these bad boys are hard to get. There’s a two per person limit and they make 300-400 a day (depending on how many get damaged). The idea is that anywhere from 150 to 200 people can get some and, let’s be honest, no one waits in line for just one. 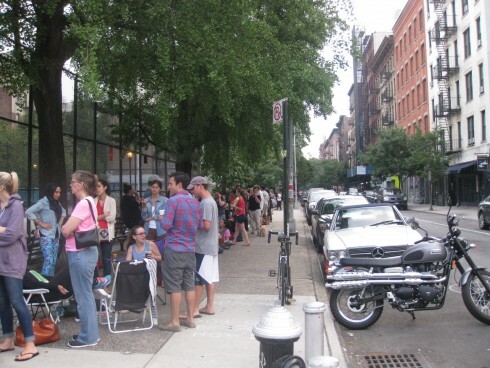 A Cronut will cost you $5 each and at least 2 hours of your time waiting in line. Oh! and did we mention that the doors open at 8 am and 9 am on Sunday. I should note that the 2 hour rule of thumb does not apply to Sunday since people will get there at 6 am. 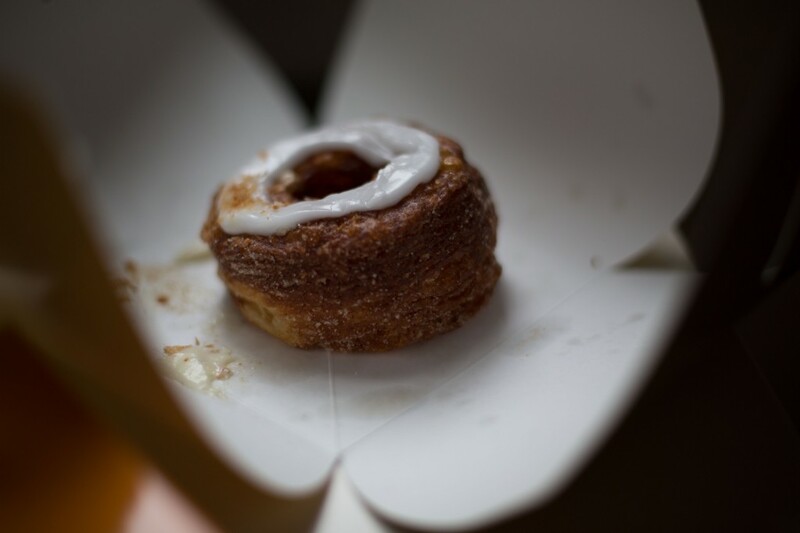 Now that you know what a Cronut is, lets get started with our adventure. Having arrived in NYC Friday evening, we knew that Saturday morning would be rough. We calculated that we should get to the bakery by 5:30 am to allow for sleep and a safe guarantee of getting a Cronut. We also LOVE New York and ended up eating and partying in Brooklyn until 4 am. So, the logical thing to do would be to get in line. 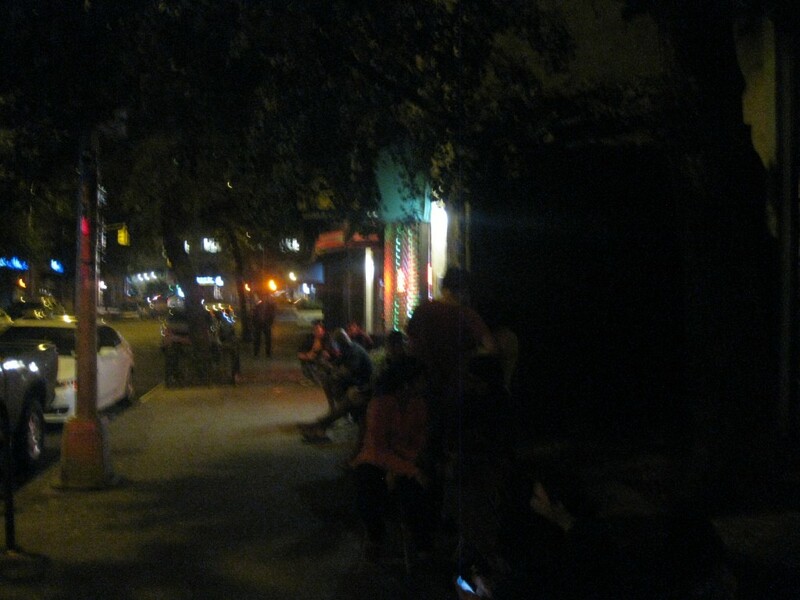 Therefore, at 5:15am I, and my friend, (also my my French language translator) became the 19th and 20th people in line. 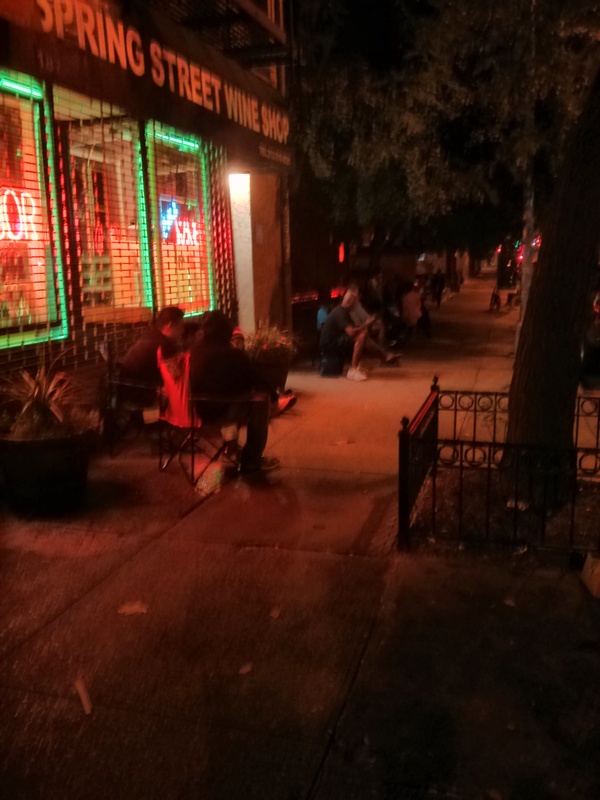 That’s right – but, not as bad as some guys that had been camping out since 2 am. People had chairs, sleeping blankets, coffee and all those that weren’t in that line had common sense but they also didn’t get a Cronut. As we wait in line we make friends. Actually, I used the time to sober up and then we got friendly. It helped that we had some cute ladies from England waiting in line behind us. As 8 am came closer we got ready and in we went – “this was finally gonna happen” and all the lack of sleep would pay off. We made it to the door and Dominique Ansel, the man whose bakery brought us this wonder, was actually there saying hi to people. I felt that was really cool. Once inside you line up and you can buy a maximum of 2 Cronuts and other pastries like their DKA (Dominique’s Kouign Amann) and Cannelé, to name a few. We got ours and sat down to eat this bad boy. 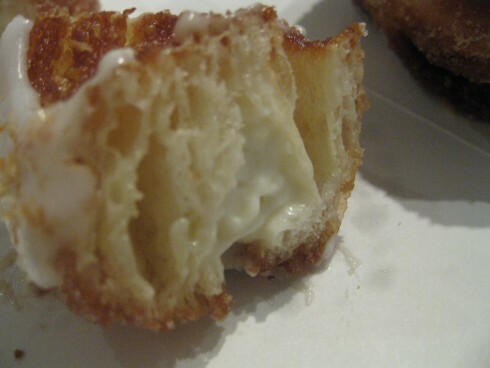 The Cronuts are only 1 flavour per month. The flavour we had was coconut. Over the last while they have had the following: May – Rose Vanilla; June – Lemon Maple; July – Blackberry Lime; August – Coconut; and in September – Fig Mascarpone. Now, I have made it a point to have various versions of Cronuts in Montreal and in Toronto because we can’t get the official one here. Even the name is trademarked (well, in the USA at least – I don’t believe it is in Canada or abroad, but that’s boring). The things that make a Cronut unique comes with the exterior. It needs to look like a doughnut while still being firm. The inside must be like a croissant and has to have to fluffy air pockets. As a bonus, there should be some kind of cream filling in there. Many have tried to copy this and we see many different creations – some that look similar while others don’t. 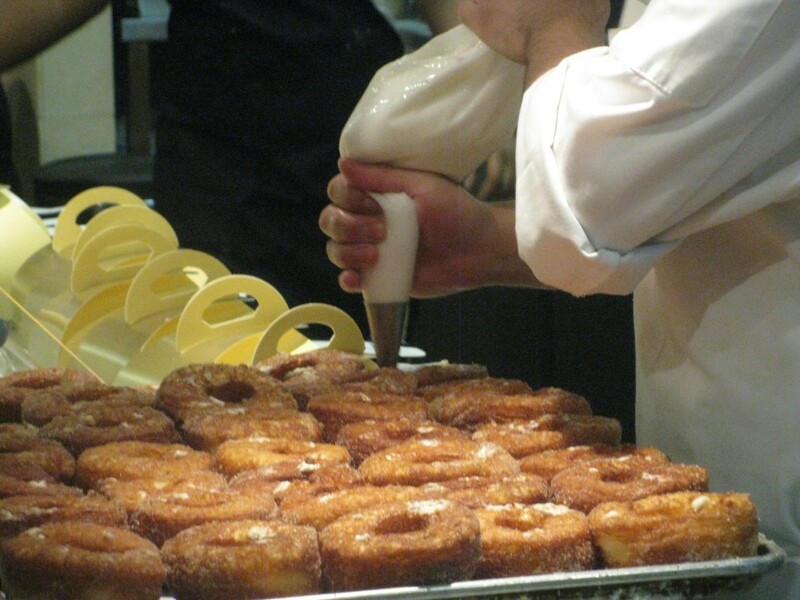 The question is how to compare Cronuts and faux-nuts fairly if we never had any. The answer is: line up and get one. 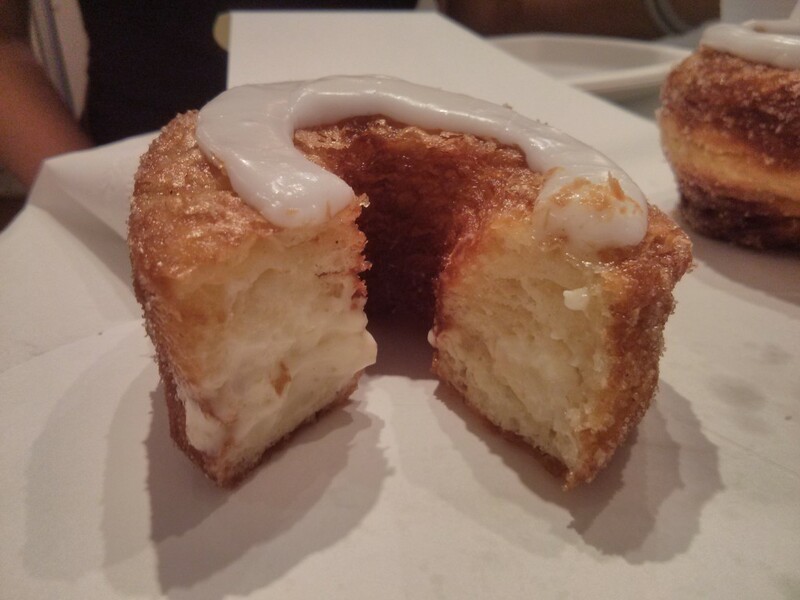 The real Cronuts have a nice firm exterior and it has some slight sugar granules around it while the outside is resilient. The size was larger than I expected. It’s wide and similar to the size of a normal doughnut you would get elsewhere. The interior has loads of layering all thanks to their use of coveted laminated dough recipe. This gives it so many layers and pockets, much more than most I have seen. There is also the cream inside which is the perfect amount. It is generous, yet not overloaded so it doesn’t make an awful mess when you bite into it. The taste is impressive. It is light – much lighter than a doughnut – yet, has that sweet taste you expect in one that you don’t quite find in a croissant. The coconut glaze on top was actually light and the cream filling was subtle and perfectly complemented the taste of the Cronut on its own. Now, to be honest, I don’t like coconut and is my least favourite choice of any but it was the only flavour offered. That being said, I did like the Cronut and the coconut flavour was well executed. With all this being said, is it worth waiting in line for hours on end at the expense of sleep? I don’t know….. I’m glad I got to try it out and I’m glad it made for a fun story of a crazy night out in New York – drinking and getting Cronuts. I am happy that my drink reviewer, Jay Pendergrast III, woke up to have a piece as well as our gracious host Bubbles (both of them were sleeping soundly when I was waiting in line). But getting there at the crack of dawn to wait in line hurt us a little, but I leave that decision to you. 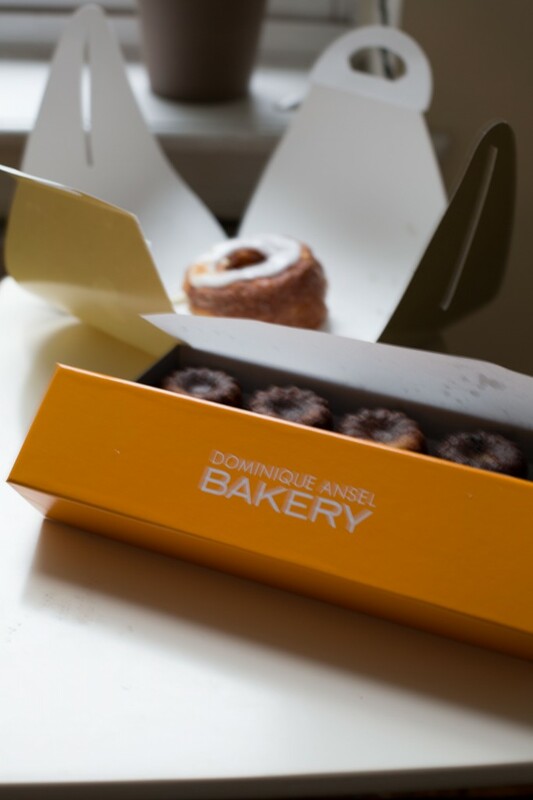 To answer a questions that lots of people have been asking: are the Montreal Cronuts versions and the real Dominique Ansel Bakery Cronuts the same? The answer is a resounding NO! The many places that have tried to copy him have not come close with the exception of la Corneteria who comes the closest. Some places have it more like a doughnut or an Italian pastry like a Zeppole San Giuseppe which, are ok if you want to go and do your own take on it…but they are not like the real Cronut. I love the fact that there is a Cronut craze happening right now which will pass eventually but, the best part is that people are falling back in love with pastries. Go to your local pastry shop, try out what they have experimented on a new pastry. I mean, people are now inspired to try all new crazy combinations – some may not work while others may be an amazing creation. 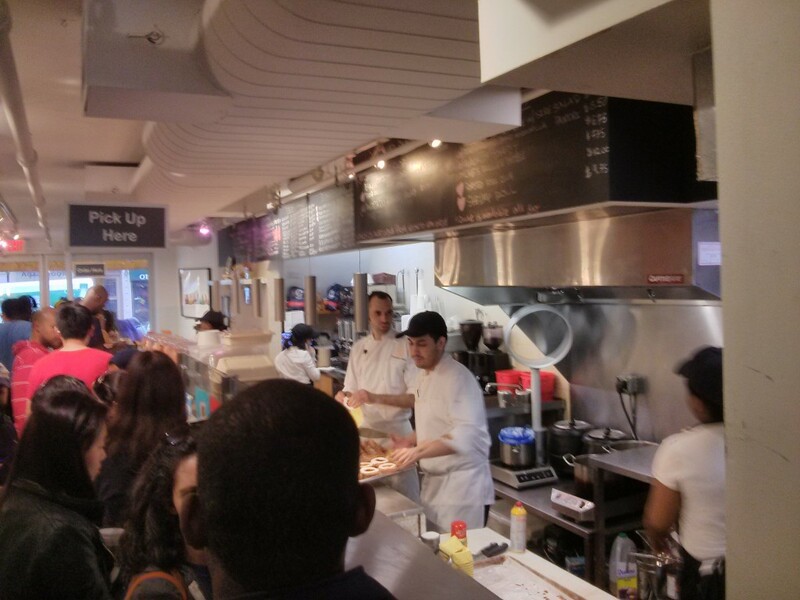 Please, if you really love Cronuts or the idea of getting one, support your local pastry shop and visit them. Buy something new, talk to them, and stop buying all your pastry item from these big box pastry stores because innovations like the Cronuts came from the little guys. Interesting take on the cronut craze! I wouldn’t be able to wait in line for hours on end for it, but I’m glad you did for the sake of the review (or your hungry belly)!